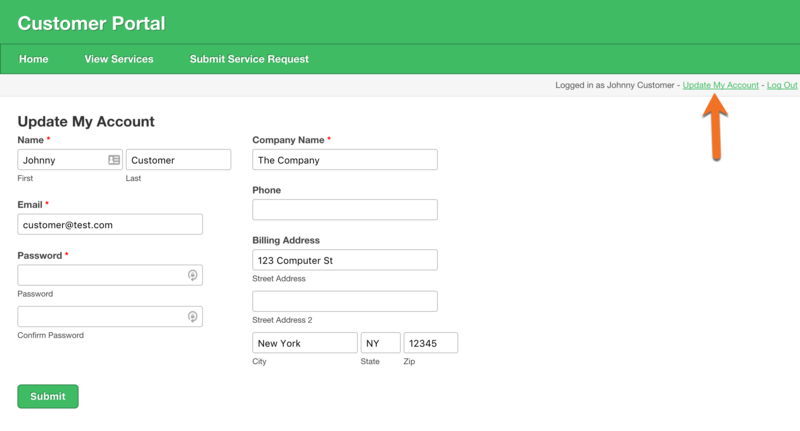 A user page is designed to handle administrative user tasks. 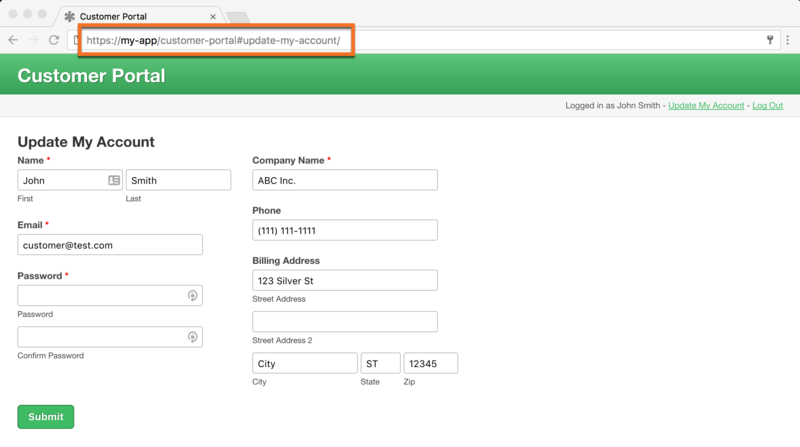 For example, they can be used to display a logged-in user’s membership information or provide a form for updating account information. User pages are only available after users are activated in your app. They can have the same page types as standard pages, except for login pages. For more information on standard pages, click here. Where Do I Access User Pages? 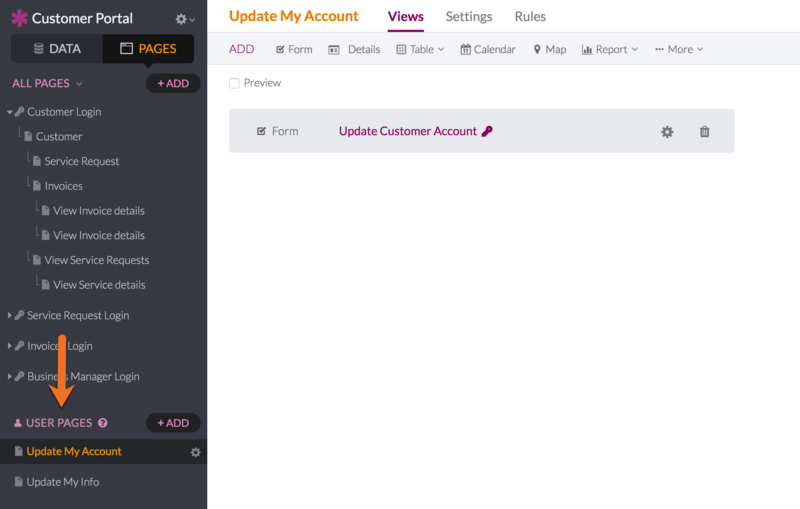 In the Builder, you can access your user pages by clicking on the large Pages tab in the left column. All of your user pages are listed in the User Pages section of the page tree. You can click on any user page in your tree to see it's views and settings. You can copy any of the start user pages in your page tree. Find the start user page you want to copy and use the “settings” gear icon to access the “Copy” option. A new window will pop up where you can give the copied user page a name. 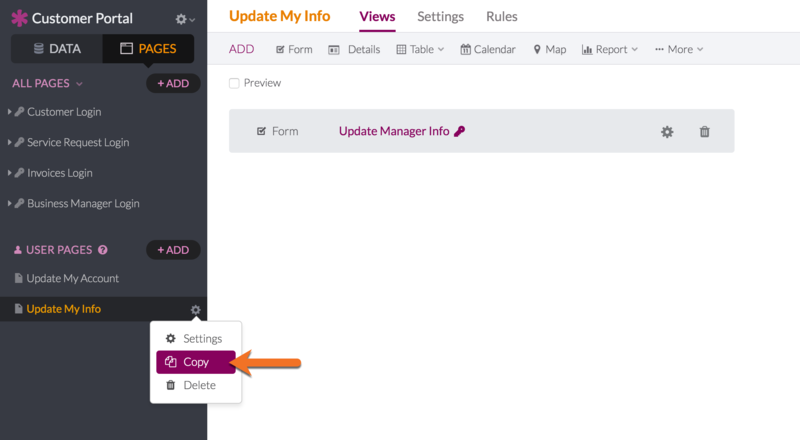 Click “Copy” and your new user page will be immediately copied and accessible in your Live App. All views and child pages will also be copied. You can delete a user page by clicking the “settings” gear icon and selecting the “Delete” option. You'll be asked to confirm the delete. You can add as many start user pages as you need by clicking the “+ADD" button in the User Pages section of the left column. If you’d like to skip the Quick Start, simply select the “Blank Page” option and you can add your views later. Note There are no options for hiding start user pages from the user menu. 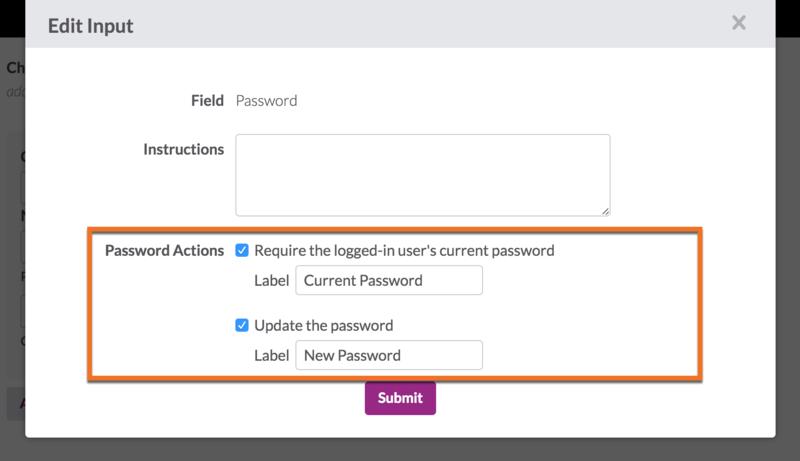 Require the logged-in user's current password: When enabled, this action requires that the user enters their current password in order to submit the form. Update the password: When enabled, this action allows the user to update their password. You can set a custom label for each action when enabled. Note: If both are enabled, then the user will have to provide both the current password and create a new password. So only enable both at the same time if you want users to provide both. You can customize other options for a page from the “Settings” tab. The page name will display in menus and links throughout your Live App. Knack builds a URL for each page by including what you add here, as well as some record identifiers when necessary. Every view linking to this page will be automatically updated to use this new URL. You'll need to update any links manually that you've typed in or entered outside the app. Page URLs need to be all lower case and can only contain alphanumeric characters. 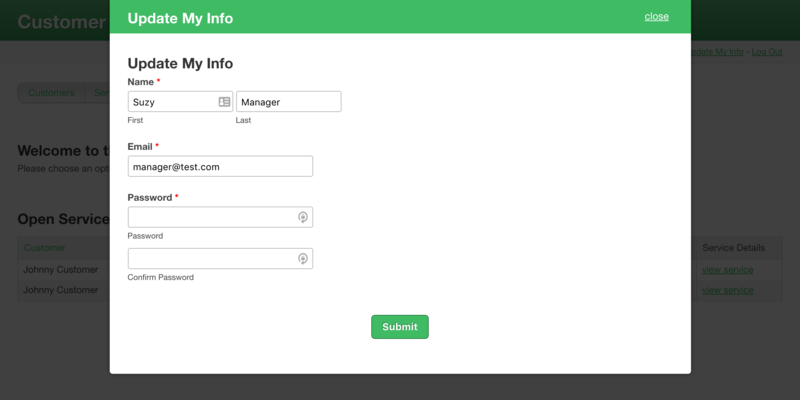 You can choose to make a user page available to all or only selected user roles. 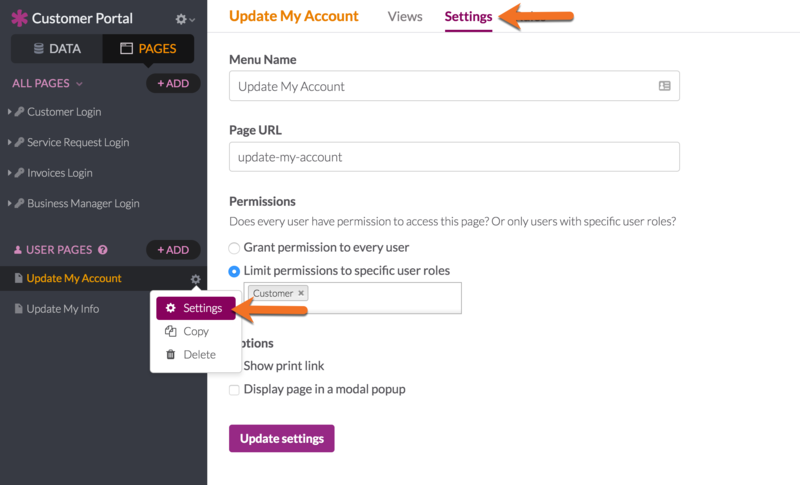 If you select the "Grant permission to every user" option, then all users will have access to that user page from the user menu. 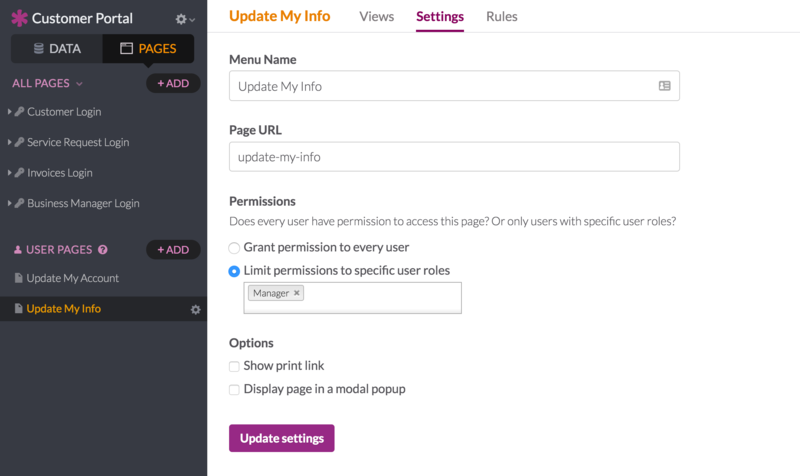 If you select the "Limit permissions to specific user roles" option, then you can select which user roles should have access to the page from the user menu. Knack Tip: The print link will be disabled if you’re also using the modal popup option. Click here for information on printing PDFs. Knack Tip: A page will only display as a modal popup if a Knack page is already rendered underneath it. This means you can still use the URL to navigate to this app from outside your Live App. However, it will load the full page instead. Page rules are actions that can be automatically triggered based on conditions you define as soon as a user enters a page. For example, let's say you want to alert your members when their membership is close to renewal. 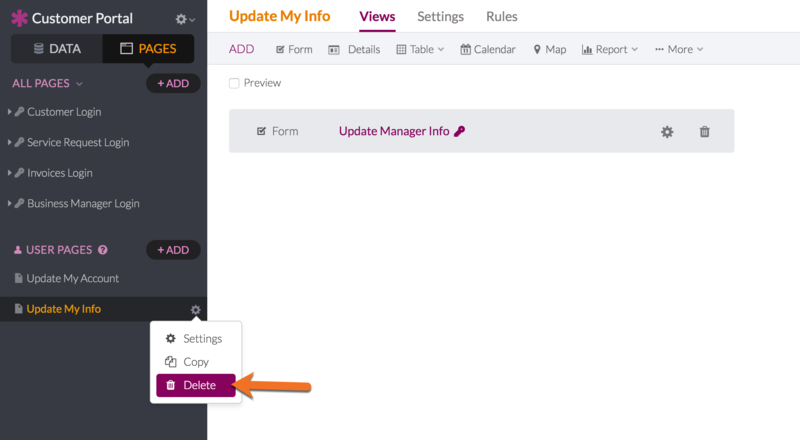 A page rule can be defined to show users a message reminding them of their upcoming renewal based on the renewal date. Click here for more information on setting up page rules.